Presumably, when Barack Obama condemns Washington, he means the Bush administration. Such criticism may be deserved, but it begs the question, is a United States Senator not a part of Washington? During the three years he represented Illinois in the senate, why wasn’t Sen. Obama’s “imagination” great enough that he could offer legislation to avert the crisis? Why wasn’t his “leadership” sufficient to pass bills to soften the blows? In fact, Obama’s reaction to the subprime crisis is characteristic of his career as a national politician. On this and a myriad of other issues, the senator’s legislative history falls short of his rhetoric. Now, it might be that Obama, like a great many of his generation, believes in an imperial presidency. (Certainly President Bush, to the nation’s detriment, has assumed himself to be this kind of president in foreign affairs and law and order.) What good, they might ask, could a single senator do? Yet that hasn’t stopped other young senators from amassing impressive legislative records, precisely because they recognize their constitutional duty: to make the laws that govern the country. And on that score — the very reason he should be a senator — Barack Obama fails to impress. An uncharitable assessment — and as a Republican I feel it a duty to offer him one — might be that Sen. Obama has maintained a low legislative profile for the sake of running for president, which he has arguably been doing since the day he was sworn-in to replace Sen. Paul Simon and started writing The Audacity of Hope. By not taking any great stands for or against legislation, by working as a junior co-sponsor for noncontroversial legislation, and by not spending any political capital, he reduced the ammunition that opponents could use against him in the campaign. Thus, by being no walk, Barack Obama could make the focus of his campaign all talk. Obama’s national legislative record, even on presumably friendly sources like Wikipedia, is remarkably thin. Even his great “accomplishment” of opposing the war in Iraq isn’t truly part of his record since Obama wasn’t even a senator during the votes on the war, so his criticism has the wonderful benefit of hindsight. Ross Douthat rightly calls this “Obama’s glass jaw,” but Sen. Hillary Clinton, for all her effort, has failed to land a blow there. The closest she came was during the New Hampshire debate outburst when she rightly condemned invoking change-as-rhetoric instead of change-as-action, but in that case she attacked John Edwards instead of Obama. This sort of attack is likely to fail for several reasons. Firstly, thanks to the dominance of conservative themes during the past 30 years, most voters under 50 have little concept of “liberal” as a “tax-and-spend” “big government” philosophy, to use a pair of Reagan-era talking points. Think about it: they didn’t suffer through the Johnson-Nixon-Carter years of liberal intervention policies, so for them, “liberal” doesn’t resonate as a negative label. Accordingly, the relative inertness of the Obama campaign is key to its marketing strength. Barack Obama equals good politics the way Nike equals good shoes, and McCain’s success will depend on getting some people to believe that McCain is Adidas to Obama’s Nike — that is to say, to prove himself an acceptable alternative to the “buyer.” However, thus far, the McCain campaign has failed to demonstrate it can properly brand the senator as a national candidate. After all, unlike the primaries, you cannot win the general election just because you’re the last man standing. You need a bigger appeal. In conclusion, if Sen. McCain runs against Obama in the fall, he must frame the discussion as a contest between a man who brought change to American politics and a man who has merely talked about it; between a man who offers results and a man who offers hope of results; and between a man who came to Washington to work and a man who came to Washington to run for president. If, on the other hand, McCain resorts to sticking Obama repeatedly with the “liberal” label or attacking positions that have broad popular support, he will lose. One of my old Spring Festival rituals has been to travel to Tianjin’s Ancient Culture Street and look at the art unveiled there. 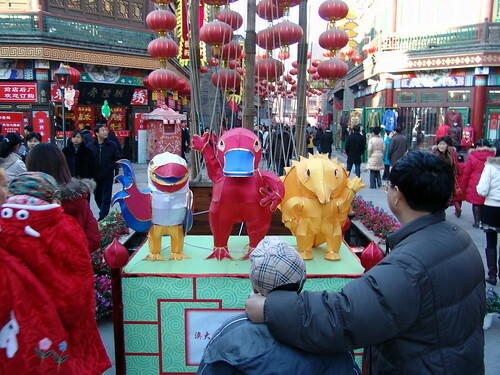 Usually, the place is decorated with three-dimensional wire-and-cloth installations representing Spring Festival themes and the Chinese zodiac animal of the given year. While there were indeed giant mice to greet visitors this year, most of the traditional art took a back seat to Olympics propaganda imagery, with the many, many Fuwa and previous mascots popping up everywhere. It was a little bit like going to the mall in Christmastime and seeing Santa shoved aside by SuperBowl merchandise. Are the Fuwa cute? Arguably, yes, but more so than any Olympic mascots in recent history, the Fuwa seem designed to appeal to children, and, by extension of that appeal, sell toys. (Those who would compare the Fuwa to the Care Bears phenomenon of the 1980s aren’t far from the truth. As such, I eagerly await parodies like this one.) Now the capitalist in me ought to embrace the marketing genius of actually using an Olympic mascot to sell things rather than just stand around looking embarrassingly ugly, but given the disconnect between the cutesy kiddie Fuwa and the “spirit” of the Olympic games, I wonder why we bother having Olympic mascots at all. One could argue that the mascots are symbols of the country and emblematic of the pride that country feels at hosting the Olympics. 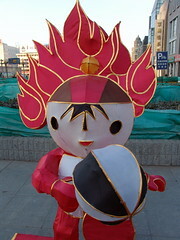 To a lesser extent they reflect the Olympics themselves, which the Fuwa do through their colors and through our friend Huanhuan to the left, who allegedly personifies the Olympic flame. Fair enough, but aside from Jingjing the Giant Panda, which of the Fuwa can be visually connected to China by most people? * How is the pride of a great nation adequately represented by dolls? Lastly, lest I be accused of needless Fuwa-bashing, I promise this is all a prelude to bashing the mascot of the 2012 London Olympics, which, if the logo for the games is any indication, promises to be spectacularly bad. * Chinese may understand the symbolism of, say, Beibei the Fish, but foreigners won’t, and that defies the point of the Olympics as a global event. ** Arguably, this was to avoid the cliché of making the sole mascot a panda or a dragon. It’s a little like slapping Chairman Mao’s face on the side of Burger King back in the States. Mmm … Burger Chairman. For what it’s worth, the food was decent, albeit standard Chinese skillet steak fare. I didn’t try the “George Washington chicken” though. Not shown but worth mentioning: the Mercedes-Benz-inspired hot pot restaurant (why?) next door to Nuba. Note that I tried to Google a website for Nuba, to no avail. But “Everything Is Connected” freaks out there might be interested to know that Nuba is the name of a Sudanese people threatened by the regime in Khartoum, a regime which is supported by a certain unmentionable government. 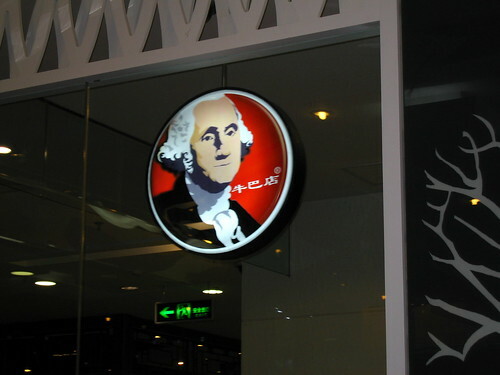 So perhaps, as they face famine, bombardment, and persecution, the Nuba people can take heart that Chinese people will eat at a restaurant bearing their name — and George Washington’s face. Not visible here: Jay’s Marilyn Monroe ring and the pink box the album comes in. Not that there’s anything wrong with that. Now, before I be accused of Jay-bashing (sorry for the pun), I like Jay and I suspect I’ll like this album, too. But his new “pink cowboy” motif comes after more than a year of enduring Kangta and Vanness, so I wonder who decided that marketing straight stars as ambiguously gay was the thing to do in China. I guess it’s hardly worse than marketing gay stars as straight, though. Hmm. That reminds me, I haven’t heard a Wham! song in ages.